Pro Display’s specialist rear projection film has a long-standing relationship with the art community, having been called on by numerous galleries, colleges and various specific art projections in recent years. The range of visual effects created by the specialist projection technology Pro Display can offer is world renowned for its diversity and flexibility, being able to offer a plethora of unique visual landscapes for artists, merchandisers and designers to bring their visions to life, as 2 artists in particular involved in the Biennale de l’Image en Mouvement 2018, The Sound of Screens Imploding discovered. 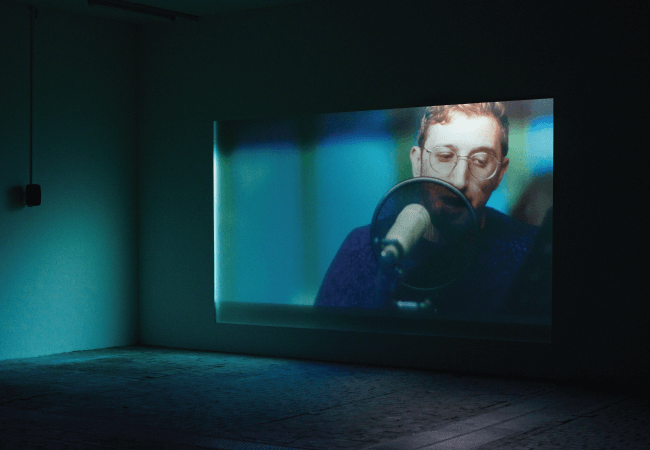 Amongst this incredible collection of 20 new works commissioned and produced by the Centre d’Art Contemporain Genève was Lawrence Abu Hamdan and Fatima Al Qadiri’s works, who turned to Pro Display’s specialist projection film to assist them with creating highly specific visual effects for their installations. 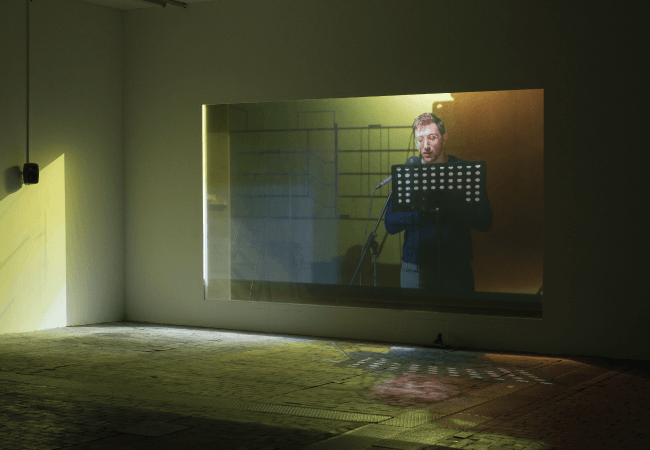 Lawrence Abu Hamdan’s work featured Pro Display’s revolutionary Clearview Projection Film, which was used to create transparency whilst projection through a glass window. The projection system also included an ET-DLE030 UST lens mounted on a Panasonic PT-DZ6710, with a brightness of 6000 lumens. Benoît Delaunay, Technical Coordinator at Centre d’Art Contemporain, commented ‘Clearview projection technology was a very helpful alternative to reach the best visual quality while answering answer artist’s wishes.’ Creating a ‘holographic’ effect that enabled the projection screen to appear as a window whilst displaying an image on the surface was the specific effect the artist hoped to achieve and by using Clearview’s Peppers Ghost visual effect, they were able to do this spectacularly. Fatima Al Qadiri’s installation, however, featured a mirror replica designed by the artist with Ultra Black Projection film that was cut exactly to the shape of the ‘so-called’ mirror. Ultra-Black, a black tinted film that offers our most high contrast image was able to portray realistic shadows and contours in an environment with controlled light, which is where Ultra Black excels. Important for an application that was mimicking a mirror, this projection film offered the artist a great solution in recreating a mirrored effect that could be controlled to display whatever the artist chose. To create this, the projection system also featured a Sony VPL-PHZ10 laser projector with a brightness of 5000 lumens, making this an effective system capturing the desired visual effect. The Pro Display Group offers a solid range of products that will excite your customers. In addition to the product mentioned in this article, there is a wealth of information about our product options available to you on our Pro Display or Intelligent Glass websites. If you have some ideas about how you would like to integrate our technology into your displays, please get in touch using the form below, or call us on +44 (0)1226 361 306.